Happy Halloween to my favorite cavemen! Recently, my husband was craving something sweet and specifically – chocolate. 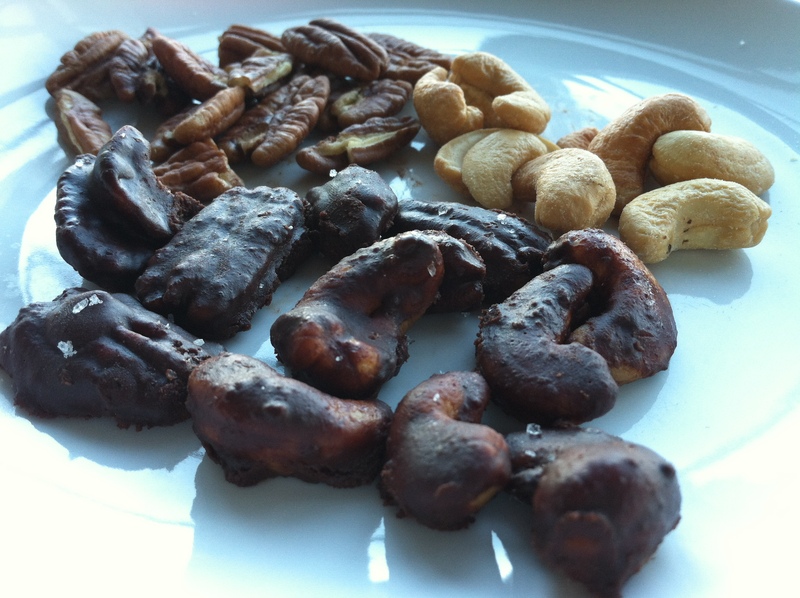 I didn’t have much time (or ingredients) but whipped up this really tasty paleo candy to satisfy his cravings. It’s one of the most simple recipes ever! I’ll probably make a better batch and be more creative this winter once the weather gets worse, but this was a fun experiment that turned out really well. I wouldn’t necessarily give this to the neighborhood kids on Halloween night, but it’s good for the primal trick or treaters! In a small sauce pan, heat the orange juice on medium heat. As it starts to simmer, reduce heat to low and add the chocolate. It should take a few minutes for the chocolate to completely melt, but once it has, slowly pour in the honey while stirring the melted chocolate. Once the honey, chocolate and orange juice are mixed thoroughly, give it a taste. (My husband has been paleo for a year and a half so I knew this combination would be good for him because he hasn’t had sweet things outside of fruit in a really long time! For others, it may still be too bitter and you can add more honey or orange juice here.) Now the fun part! Take the nuts of your choice (I used pecans and cashews because that’s all we had at home but next time will add macadamia nuts and almonds) and drop them in the chocolate. Mix the nuts around until they are fully coated and then scoop each one out with a fork and place on parchment paper. Sprinkle a tiny bit of sea salt on each nut – trust me it’s worth it. The salt is the best thing about this recipe and adds a surprising and savory aspect to make it feel like you’re eating real (paleo) candy! Put in the refrigerator and let cool. Once the chocolate has hardened a bit in the refrigerator – gobble them up! Hope you enjoy this treat for Halloween. MMmmmmmmm.. Just what I craved :o) I just used raw cacoapowder and some cacaobutter, melted it with a teeny bit of maple and cinnamon, used nuts that were precooled in the fridge, sprinkled with some salt and somme more cinnamon. Christmas bites!! Thanks! Although the taste of these is excellent, the chocolate didn’t harden after cooling in the fridge overnight. The nuts are wet from the chocolate so I have to eat them with a spoon! Any suggestions? Hi Tzuriel, thanks for the comment! Try putting less honey or orange juice (alternatively – you can freeze it quickly to get it to harden before putting in the fridge). Our setting is on extra cold in the fridge so perhaps that’s why mine hardened. This recipe is way too liquidty. Mine never did harden…it stayed like soup. I wouldn’t recommend this recipe. Sorry to hear Claire. Maybe try less orange juice? I made it again and it still came out well. I think the important part to remember is that while you mix the chocolate and OJ together, you have to heat and stir in the saucepan long enough so it thickens a bit before you coat then nuts in them. Hope that helps!